Rolling into Geneva in a secured convoy this afternoon, hundreds of amateur riders from around the globe completed the 7th edition of the Haute Route Alps. With 896km and over 22,200m of climbing in their legs, each and every one of the riders more than deserved their finisher’s polo and medal. Having set off from Nice seven days ago, today’s final stage started in Morzine and headed in the direction of Geneva via a 5-col route over the Encrenaz, Ramaz, Cou, Feu and Saxel climbs. After a short neutralised section that took riders out of town, the first timing mat signalled the start of a fully timed stage all the way to the final timing mat of the week in Massongy. The first two climbs up Encrenaz and Ramaz came back to back within the first 25km. The little-known col de Cou, col de Feu and Col de Saxel then presented the final three challenges of the week. Cresting the last climb at 943m above sea level on the col de Saxel, riders plunged downhill for a final time towards the Lac Léman to collect their finishers’ medal and polos in Yvoire. 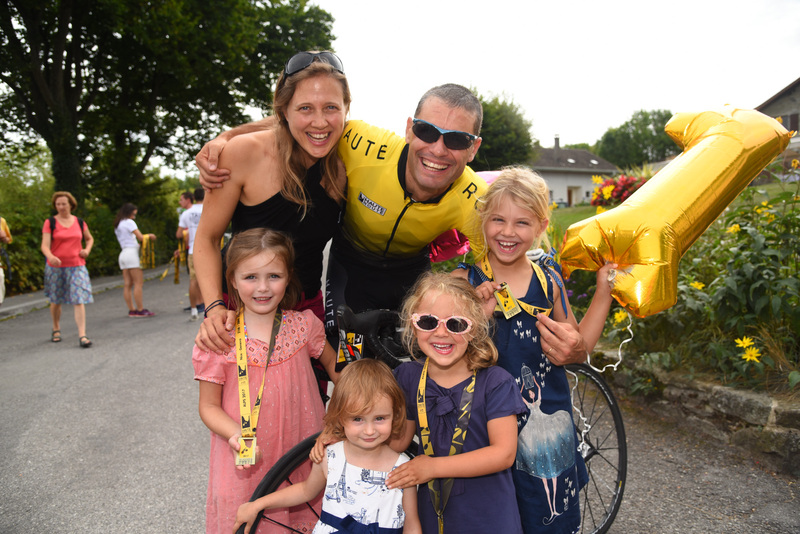 Grinning ear to ear with a 2017 Haute Route Alps finishers’ medal around his neck, Duncan Watt from the UK was speechless: “The feeling is beyond words,” he said, “I only decided to ride this event 4 weeks ago, so I wasn’t sure I’d finish, to be here with the medal now is amazing”. Reflecting on a memorable week, team Burgess Hodgson teammates Keith Watson and Rod Archibald exchanged thoughts: “It was great to tick off some of the climbs I’d never done, the Madeleine and Izoard were my favourites,” said Keith. “The hardest day was stage 5 with the 185km,” added Rod, “we basically went straight to the hotel for dinner and bed and were right back on the bike in the morning. It was my first time on the Haute Route,” concluded Rod, “I’ll definitely be back next year for a new route through the Alps”. After recovering a little and beginning the celebrations in Yvoire, riders congregated for a final time for the secured convoy and procession into the Jardin Anglais and finish line in Geneva. Arriving to the applause and praise of their families, friends and supporters, it was an emotional moment for all as the realisation set in of what they had just achieved. Tomi Mikola from Finland was delighted with his second Haute Route Alps experience, “The weather has been amazing, I couldn’t have asked for more,” he said, “I’ve had a great team with me all week, we’ve had a brilliant time together. I’m looking forward to the party tonight, we can celebrate the collective achievement with all the riders in Geneva”. “That was probably my best week of cycling,” exclaimed German rider Wolf Thyssen, “everyday was the highlight, the weather was perfect and I was surprised with how well I rode. Maybe I’ll do Norway or the Rockies next year, we’ll see”. Capping off an incredible week of riding, the final stage of the week was won by Nicolas Roux from France for the men and Emma Pooley from the UK for the women. Winners overall this week were Nicolas Roux and Marjolaine Bazin; both can take pride in having fought hard to win possibly the toughest Haute Route Alps event to date. Returning for an eighth edition next year, the 2018 Haute Route Alps event will include once again the best of the best in French alpine cols, mountain towns and memorable cycling. The third week-long European Haute Route event of the summer will also be getting underway next weekend in Innsbruck; riders will set off for 7 days of riding through the iconic Italian Dolomites to reach the finish line in Venice.